Sandrafelis Chebet won her second course event of the year at the first Athletics Kenya Cross Country Series meet in Nairobi, winning the senior women’s 10km race. The 2017 World cross country U20 finalist won in in 32:53, just a week after topping the Ndalat Gaa Cross Country last weekend. A morale boosting win for the Chebet who is eyeing a place in Kenya’s team for the Commonwealth Games in April and the African Athletics Championships in August, for her debut international senior debut. “All I am doing right now is getting my body back into shape and preparing for next season. 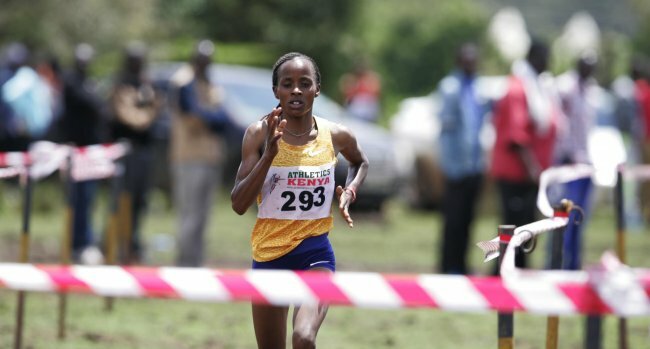 Running in the seniors is tougher and that means I have to work extra hard in training,” said Chebet, the 2015 World Youth silver medalist on a slippery and muddy Posta Grounds in Nairobi. She finished ahead of 2017 World Cross Country silver medalist Lilian Kasait who timed 33:14 and Gloria Kite third(34:01). “We had to be very careful with the course. It is not easy to run in such conditions but we adopted quick enough. It got even tougher when it started raining while we were still running, but at least we managed to finish,” Kasait said. The duo had maintained front running from the start with the leading group whittled down to four from a group of eight at the 6km mark. Kasait, Chebet, Peninah Kandie and Gloria Kite pulled away from the rest of the pack. But in the final loop with only two kilometers left, it became clear that it was either Chebet or Kasait for the title. Chebet bolted away from her compatriot in the last kilometer, increasing the pace as she sped off to the finish line. David Bett won the men’s race in superb fashion, leading from gun to tape in blistering pace. “I started running and I felt my body had a lot of strength and endurance. I decided to go on till the end. It wasn’t really a strategy and I am pleased the gamble worked out well. I didn’t do well in Ndalat and this is a huge consolation,” Bett said. The senior men’s race included some high-profile figures including World 1500m champion Elijah Manang’oi, 400m athlete Alphas Kishoyian and 800m man Jackson Kivuva. Manang’oi ran in his first ever cross country race finishing 50th. “I am just one month into my training and this was a great way to test myself and step up my search for fitness. It is my first ever time running in the cross country. It wasn’t easy,” said the world champion. He was earlier uncertain whether he would compete because of the slippery state of the course and his lack of 100 percent fitness and only changed into running gear on advice from his coach Bernard Ouma. Peter Matelong came second in a time of 29:29.8 while Peter Njoroge came third clocking 29:30.8. At the third loop as they completed the six-kilometer mark, Korir maintained his lead with Matelong and youngster Meshack Letim following him closely waiting for him to tire off and pounce. But the race leader kept his pace and by the time they came to the bell, he had opened a 200m gap between him and the chasing pack. Beatrice Chebet won the junior 6km women’s race in 20:01.9 ahead of Agnes Makali (20:10.9) and Janet Jepkoech (20:17.6) who were second and third respectively. 17-year-old Kiprono Sitonik won the corresponding 8km boys’ race in 23:35.5 ahead of Sila Kiptoo and Nicholas Chelule who were second and third respectively.